Hundreds of President Trump's most ardent supporters are calling on him to veto the GOP's Obamacare replacement bill, known as the American Health Care Act. 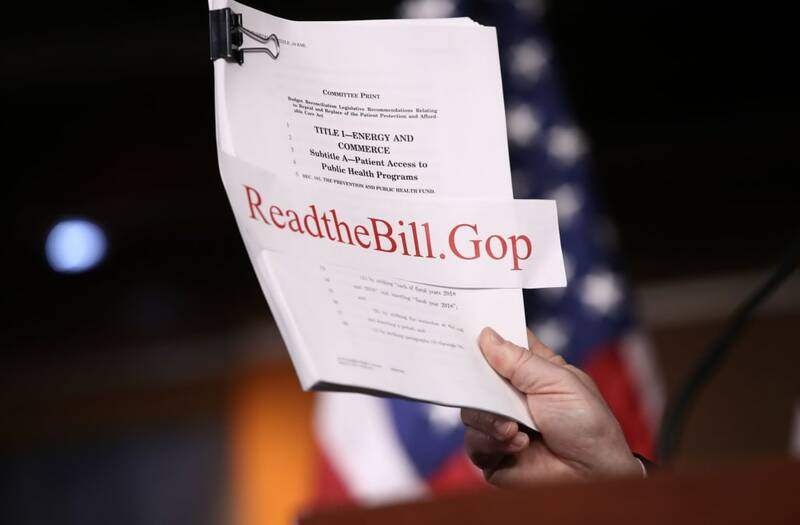 The proposed legislation, introduced in the House on March 6, would repeal key parts of the Affordable Care Act, including the individual mandate, but would introduce new heavy charges on those who allow their health care plans to lapse. Some popular aspects of President Obama's signature law would remain in place, like the requirement to cover those with pre-existing conditions, and coverage of dependents until the age of 26. 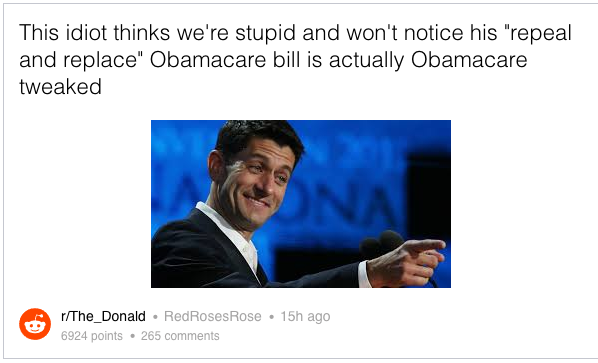 Some of Donald Trump's fans on Reddit and Twitter saw the proposal as a betrayal of what Trump and the GOP promised them, deeming the legislation "Obamacare lite," and "swamp legislation." Back in January, Trump promised "insurance for everybody" under his Obamacare replacement plan, though the GOP plan allows insurers to charge elderly Americans up to five times as much as younger people. Paul Ryan, House Speaker and one of the bills main backers, was widely targeted by Trump supporters as a "RINO" and "establishment globalist cuck" while they criticized aspects of the bill. One user wrote "There are very few benefits to the free market. No reduction in burdens to physicians. No tort reform. No free market insurance plan crossing state lines...Clearly the swamp is still writing legislation." Several hoped Trump would veto the bill upon its arrival on his desk. Trump supporters on Twitter were just as vocal, tagging the president and begging him to oppose the replacement legislation. President Trump appeared hesitant to offer his full support for the bill, releasing a brief statement only saying that the bill was "an important step towards restoring healthcare choices," and that the president "looks forward to working with both Chambers of Congress to repeal and replace Obamacare." He later offered stronger support, tweeting that the healthcare bill was "wonderful." The post Trump Fans Urge President To Veto Obamacare Repeal Bill appeared first on Vocativ.